For years Discovery Space has been a place for hands-on learning, and it's expanding to include a community makespace called The Rivet, with classes, space and tools available to allow people of all ages to dig in and create. “This [State College area] community is very supportive of entrepreneurs, but there is no place for prototyping or light manufacturing. We are filling a gap that will make it easier for community members to bring their product ideas to life,” said Crowl. Thanks to funding provided by the Centre Foundation’s Centre Inspires grant, Discovery Space, located at 1224 N. Atherton St., State College, plans to renovate the 5,000-square-foot garage attached to the rear of the building into The Rivet. Included in the renovations will be a space for woodworking and metal working, along with vinyl cutters, laser cutters and pottery stations. Large work tables and meeting space for conversations between two or three people are also included in the plans. A back bay will hold a classroom designed to house computers, 3D printers, electronics, plastics fabrication as well as an additional space for larger gatherings. 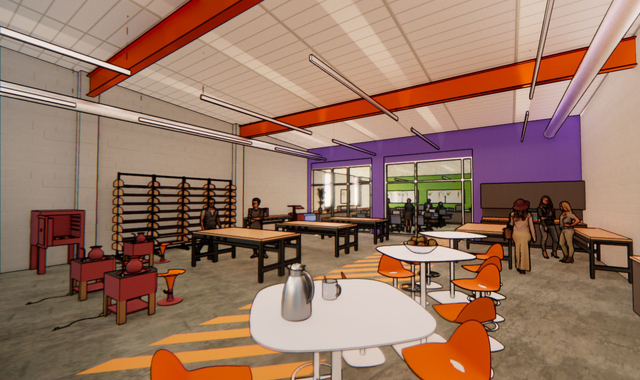 An artist’s rendering of the middle bay includes vinyl cutters, laser cutters, pottery stations and more, with large work tables and meeting space for conversations between two or three people. Image provided. “We are putting manufacturing back into the hands of people. There are times when entrepreneurs have to send parts out to be manufactured and it can get quite expensive. We will have a variety of wood working and metal working tools that people may not have in their garages, along with the ability to vinyl and laser cut or 3D print items. This will make the process faster and less expensive,” said Camille Sogin, assistant director of The Rivet. Renovations in the space will be underway this spring and part of the summer. In the meantime, The Rivet will be hosting maker-themed programs in Discovery Space’s current classroom starting Feb. 25. The programs are meant to introduce the community to what The Rivet will offer, show off a few maker-themed activities and connect like-minded people in the community. The first set of programming kicks off Feb. 25 with a free Maker Monday event from 6 to 8 p.m. Bring your own t-shirt to customize and enjoy a free tap cocktail from Big Spring Spirits if you RSVP by Feb. 23. This event will be for 21 years and older only, but future Maker Mondays will be open to all. “Once the space is operational, entrepreneurs, hobbyists and artists can purchase memberships to use the tools for their projects and prototypes during open hours, gain a new skill or learn how to make something for home. People of all ages can enroll in project workshops and skill-building classes. The Rivet aims to empower teens to both consider and taste a career in the trades, and also learn about and have access to tools that they might leverage on their way to becoming entrepreneurs,” said Crowl. Crowl said The Rivet is looking for volunteers to help with events, social media and more, as well as skilled community members interested in facilitating programs. For more information about The Rivet, contact Crowl via email at [email protected]. Sign up at TheRivet.org for email updates of the latest progress of this project.